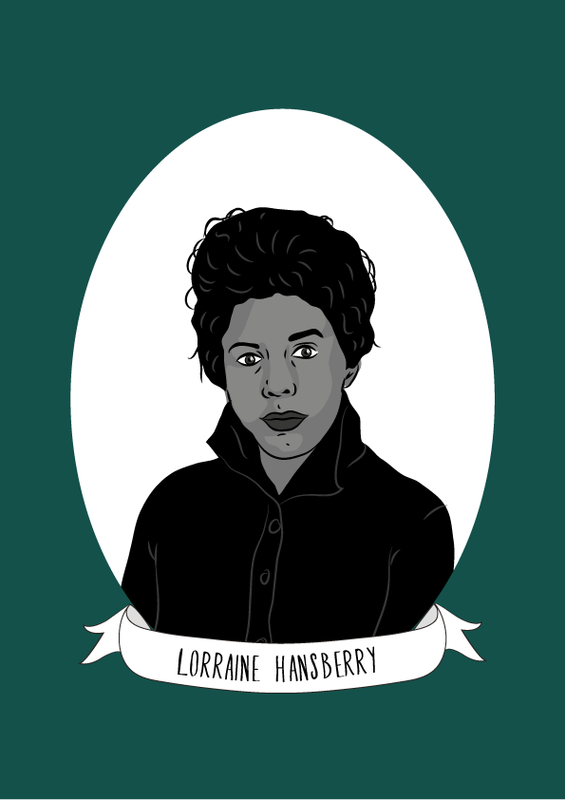 Lorraine Hansberry was an American playwright, civil rights activist and writer. Her groundbreaking play, A Raisin In The Sun was the first to be performed on Broadway written by a black woman and performed by a black cast. Hansberry was born in 1930 in Chicago, Illinois to politically active parents. Eight years later, after her parents had purchased a house in the Washington Park Subdivision of the South Side of Chicago their white neighbours tried to force them out. Hansberry’s father took his fight against housing segregation to the Supreme Court, and won. Hansberry grew up in a household that was regularly visited by prominent Black intellectuals like W.E.B. Du Bois and Paul Robeson. Hansberry continued her education at the University of Wisconsin–Madison where she followed in her parents footsteps and became politically active. She was said to be “the only girl I knew who could whip together a fresh picket sign with her own hands, at a moment’s notice, for any cause or occasion” and fought to integrate a dormitory at the school. In 1950, Hansberry moved to New York City to pursue her writing and settled in Harlem where she continued her activism and fought against evictions. A year later, she began work at the black newspaper Freedom with some of the men who’d been frequent visitors to her family home – W. E. B. Du Bois and Paul Robeson. Hansberry wrote about civil rights struggles both in the U.S. and further afield, covering stories like the Mau Mau Uprising in Kenya which the mainstream press had ignored. In 1952 she attending the Montevideo peace conference in the place of Paul Robeson, an action that would put her on the FBI watch list. During this time, Hansberry married. The romantic relationship was brief, as Hansberry would later refer to herself at that time as a “heterosexually married lesbian”. Hansberry then went on to date women, and joined the first lesbian political organisation in the U.S the Daughters of Bilitis. At the time, this would have made her a target of federal law enforcement. She also wrote for group’s journal, The Ladder in which she put forth a feminist case against homophobia. In 1959, Hansberry’s play A Raisin in the Sun became the first play written by an African American woman to be produced on Broadway. She became the youngest American playwright and only the fifth woman to receive the New York Drama Critics Circle Award for Best Play. The play also brought her to the attention of the FBI once more for its ‘dangerous Pan-African themes’.